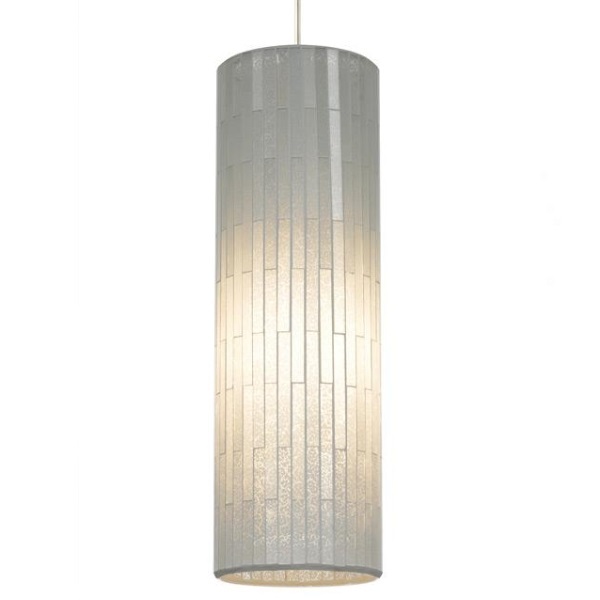 A large cylindrical shade composed of glass mosaic tiles and inner frost glass diffuser. Black, satin nickel, and white finish options highlighted with satin detail and clear cable; antique bronze finish highlighted with antique bronze detail and brown cable. Includes 120 volt, 60 watt or equivalent medium base BT15 or 26 watt GX24Q-3 base triple tube compact fluorescent lamp (electronic ballast included). May also be lamped with 32 watt GX24Q-3 triple tube compact fluorescent lamp (not included). Fixture is provided with six feet of field-cuttable cable. Incandescent version dimmable with standard incandescent dimmer.